Possibly Unique, English 19th Century Lignum Vitae Leech Jar, unrecorded in Pinto,Thomas,shepherd and Levi. 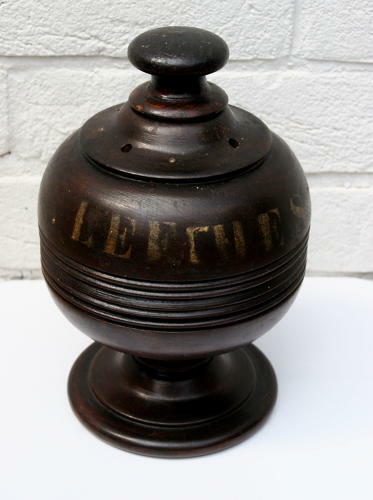 Turned Lignum Jar with historic painted word "Leeches" and "X, P, 8 & 2" on side. Detachable lid/stopper not lignum but definitely original. This is possibly the only known example in treen.